Are there any fans out there of the Food Network show “Chopped”? In case you’re not, I’ll give everyone a brief explanation: “Chopped” is culinary cooking competition show that features 4 chefs/cooks that are required to cook a three course meal for three judges for a prize of $10,000. What’s the catch? They have to cook each course in a very short amount of time. I’m talking 20-30 minutes. Then, they have to successfully incorporate 4-5 unique, rare (and sometimes just bizarre) ingredients into their food. Each dish is judged based upon taste, creativity and presentation. After tasting each dish at the end of each round, the judges deliberate as to which chef prepared the weakest dish, and that unlucky duck and their dish is placed on the chopping block, and ‘chopped’. If that sounds pretty tough, then I guess that’s because…well, it is. In the first place, I can’t imagine putting together four plates of food in thirty minutes, not to mention making them meet the standards of professional chefs with Michelin star restaurants. Second, I’m absolutely terrified of doing anything with ingredients like durian, sweet breads (Google it), or ostrich tenderloin. My mind draws a complete blank when even trying to imagine planning a dish with those things. I couldn’t do it in an hour, much less the few seconds the chefs have to deliberate before actually starting to cook. Third, can you imagine putting a plate of your food down in front of Iron Chefs Geoffrey Zakarian and Alex Guarnaschelli and waiting to hear their feedback? Just the thought of that makes me wanna sweat bullets. If they like my food, I’d feel like 1 million bucks. If they don’t, I’d quit cooking forever. Just kidding about that last part (…I think). I like “Chopped” for a lot of reasons, but the primary one has gotta be that I have a great deal of respect for the people that actually have the guts to sign up to compete on the show. Cooking may be my sport, but even I don’t think I’m good enough to do that. Having said all that, I do sometimes find myself putting together dishes for my family that have a “Chopped’” kind of theme to them- meaning, I open my pantry/fridge, and scrounge around for random ingredients that I end up throwing together, knocking on wood, saying a prayer, and hoping that it turns out in a tasty dish. 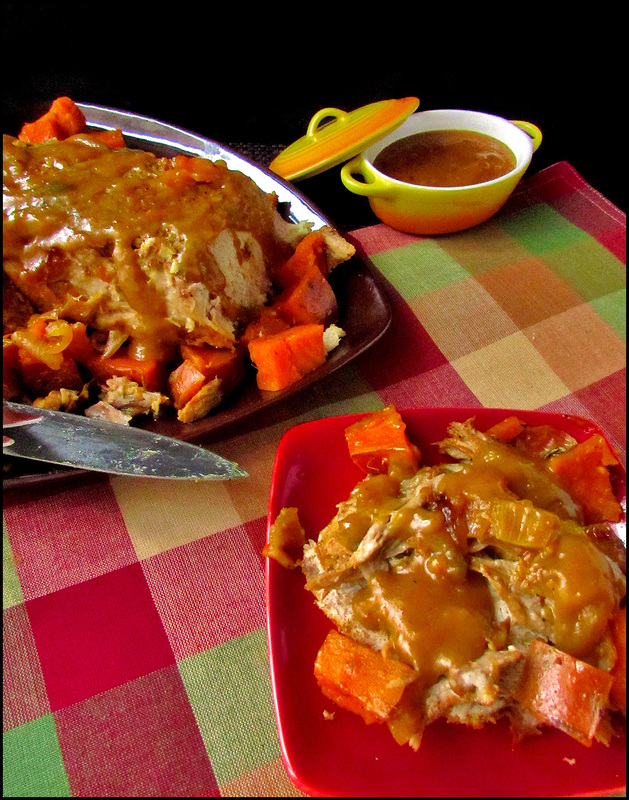 This roast is one of my favorite ‘Chopped-Jess-style’ dishes. I’ve made it a few times before for my family, but this time around, I actually had enough time to write down the exact ingredient measurements to form into a recipe. 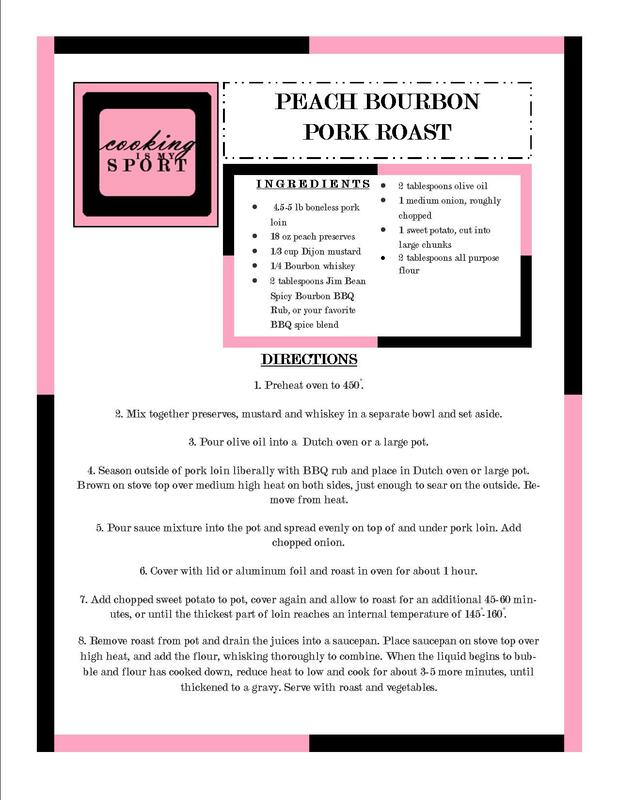 The peach preserves give the pork the ‘sweet’, the mustard gives it the ‘tang’, and the Bourbon gives it a ‘zip’. It may sound like an odd combination, but they all really do work very well together. Trust me. I wouldn’t lie to you. I used sweet potato as an accompaniment to the roast, but if you’re more partial to white, you can always substitute accordingly. One more thing: I know that the recipe calls for this to roast in the oven, but I’ve also made this dish before in the slow cooker and the results were just as good. Choose whichever works for you. FEED(ME) BACK: Do you watch Chopped? What’s the craziest thing you’ve ever seen in the ingredient basket? 2. Mix together preserves, mustard and whiskey in a separate bowl and set aside. 3. Pour olive oil into a Dutch oven or a large pot. 4. 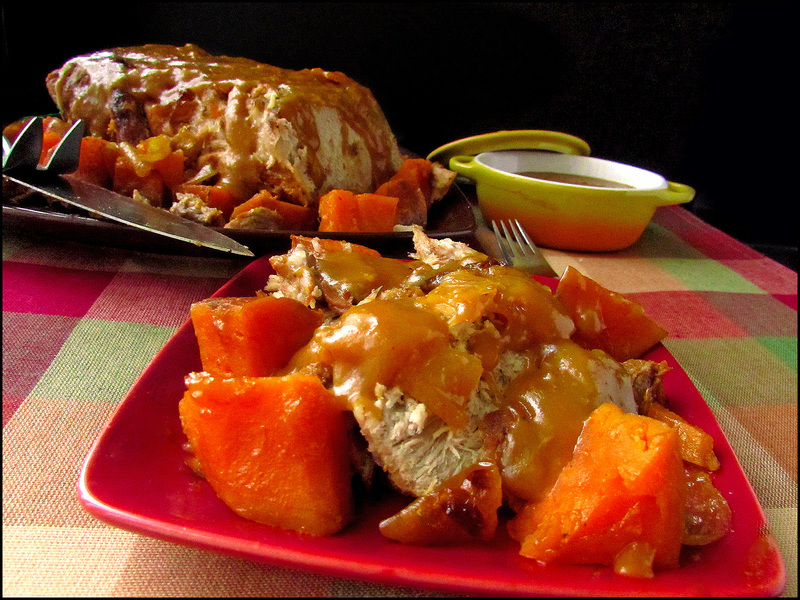 Season outside of pork loin liberally with BBQ rub and place in Dutch oven or large pot. Brown on stove top over medium high heat on both sides, just enough to sear on the outside. Remove from heat. 5. Pour sauce mixture into the pot and spread evenly on top of and under pork loin. Add chopped onion. 6. Cover with lid or aluminum foil and roast in oven for about 1 hour. 7. Add chopped sweet potato to pot, cover again and allow to roast for an additional 45-60 minutes, or until the thickest part of loin reaches an internal temperature of 145°-160°. 8. Remove roast from pot and drain the juices into a saucepan. Place saucepan on stove top over high heat, and add the flour, whisking thoroughly to combine. When the liquid begins to bubble and flour has cooked down, reduce heat to low and cook for about 3-5 more minutes, until thickened to a gravy. Serve with roast and vegetables. I love chopped! I don’t watch the food network anymore, I canceled my cable a while ago, because that’s the only thing I basically watched, chopped, maybe Iron Chef, and Alton Brown. Paying 100 bucks just to watch one thing wasn’t worth it. 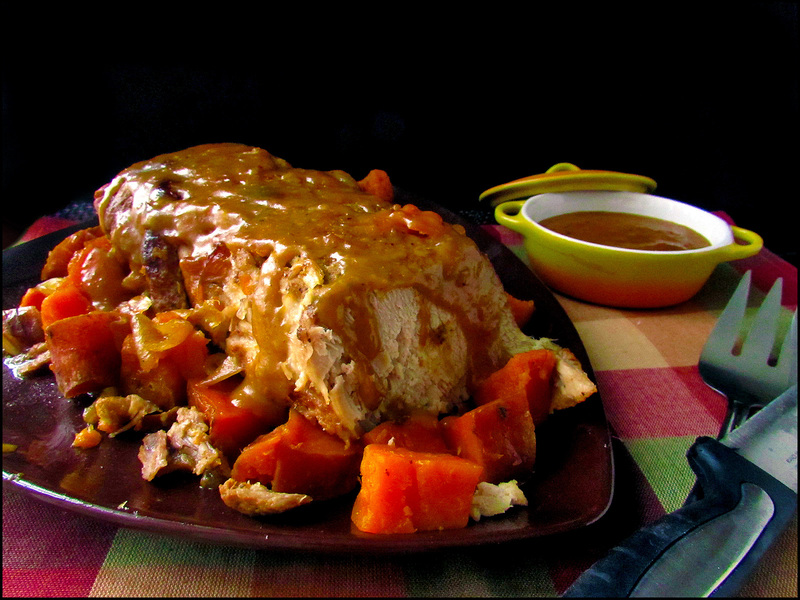 I have so much respect for some of those people that could figure out what to do with those crazy ingredient combinations… anyways, peach bourbon pork roast, I say yes 🙂 this has to be good!